One afternoon last week, while on our way home from Cousin's brother's pool, the SYO wondered aloud how I knew where I was going and if we were lost. Cousin had taken her youngest home earlier for a nap and we were lucky enough to have the star sleeper in town (Big), who took a nice nap in the pack and play while we lingered in the pool with the 105 degree sun at our backs. Without her to follow home, the SYO figured that we would not be able to find our way back. I had, in fact grown up in Omaha, and we were not far from my old digs at that point. Do you want to see the house where I grew up? Cousin and I grew up about a block away from each other and the SYO was aware of the local lore. YEAH! I wanna see the big hill you had to walk up to visit each other. I'd given her the old -- it was up hill BOTH ways -- thing. We drove slowly past my old house. It has changed a lot. The crab apple tree that I used to climb out front has been cut down, there is a fence around the yard. The pairs of evergreens that cornered the backyard, creating the best hideaways beneath and between them for little summer daydreamers had obviously also passed on. But I noticed one steadfast landmark: my mother's birdbath. We drove away, but I was obsessed with the birdbath for the next several days. My mom died when I was nine, and that house held a lot of memories for me. Plus, I only have a few things of hers, so I felt like an archaeologist who had just excavated the missing link. Had I discovered one of the last remaining vestiges of my mother? I imagined her moving in to the new house, and with her love of birds (hence the apropo shortening of her name, "Alberta" to the nickname "Bertie") putting up a birdhouse and birdbath. I imagined her painstakingly choosing among many birdbaths, and then the decision about where in the yard it would live. In fact, I did not even know if she had actually put it there. Had it been in the back yard when they moved in? I interrogated my aunt (Cousin's mom): Do you remember it? Did she put it there? Was it hers? Maybe I was justifying ownership. Reparations if you will. In any case, she, nor any of her sons (my older cousins) even remembered its existence (I did not have the above pictures as evidence with me). But this fact only fueled my obsession: if they did not remember it, then she SURELY put it there, no? Or, maybe it was so consistent with her landscape that it did not stand out for them, the way it did for me. Plus, if I remembered correctly, it was made of concrete, and it had obviously not moved in nearly 30 years. If someone could move it, wouldn't they have? Now that the trees were gone, it seemed absurdly far away from the corner of the fence. I'm sure I have changed everything about the landscape of our own backyard. My fingers have touched everything, making claim on all parts of our scenery. It MUST have been her doing, since it was in the exact same position I remembered it so long ago. Discussions about the method of acquisition ensued. Cousin felt that it was my due. BioMom felt that taking it would be unethical. Cousin's brothers still didn't belive it existed. Cousin's mom thought we should offer the current residents some cash in exchange for the birdbath. The house itself has a rather well-known tragedy associated with it. One that any Omahaian of the early 1970s would be well aware of, were they given a little nudge to remind them. 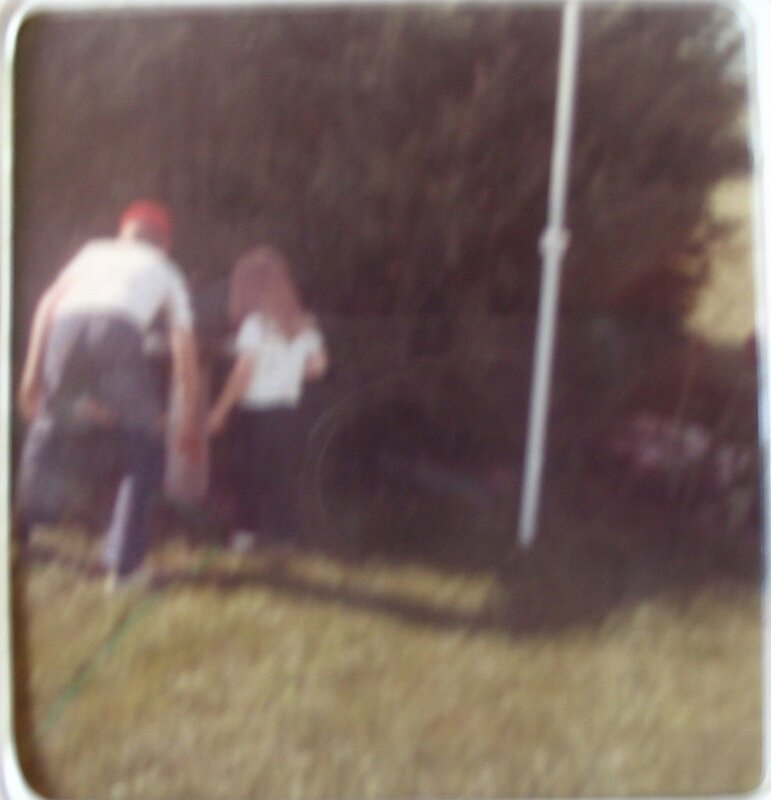 I imagined ringing the doorbell and inquiring after the birdbath, reminding them that I was the one-year-old in the house at the time. This was a rather manipulative approach, and it also felt quite risky to me. What if they said "No"? Stealing would be an inadequate alternative in the wake of such a rejection. In the end, Cousin, fortified with some liquid courage, talked me into taking the (ahem) road less traveled. 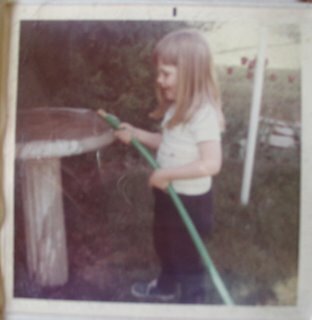 Under the cover of darkness (and a black shirt that her husband loaned me) we went back to the scene of our childhood and attempted to retreive my mom's birdbath. We had it all worked out -- park the car far away. . . Enter through the back yard neighbor's. . . replace the birdbath with a newer version. We did not expect the friendly, but loquacious dog. No steaks or large bones were in sight. In the end, we got away only with the top portion. Biomom's response: YOU'VE GOT TO GO BACK AND GET THE BASE! I unloaded it from the car yesterday and, in all of it's old, cracked glory, I am in love with it, and feel like I have a piece of my mom here with me in Minnesota. You should send the new home-owners anonymous photos of the birdbath in all the famous locations of the world. A la Amelie. That was a delightful post! I agree with Biomom-- if you did decide to get it, you should've got the entire thing! :-) And thistles' idea is a very good one. I have been reading your blog since the past couple of months, and I like your observations about things in general, particularly the dry-ish comments about people around you that often paint their personalities in a unique way. Thistles: Great idea, however, I think it might break the airlines' weight limits at between 50 and 75 lbs... I'll weigh it. But love the Amelie reference! We thought that the current residents might have a great laugh to discover a new birdbath in the back to replace the old. a.s.: the bottem was totally anchored. Cousin was on that side of the fence using her weight to try to pry it out of the ground as I kept the friendly dog busy. She claims it didn't move more than a millimeter or so. Cousin? Want to weigh in?